Erickajoy Daniels is a community resource with over two decades of development and consulting experience. She currently leads system-wide diversity and inclusion efforts at Advocate Aurora Health, Wisconsin’s largest private employer and the 10th largest not-for-profit health system in the nation. Previously, Erickajoy was responsible for organizational development and global talent management at Brady Corporation in Milwaukee. 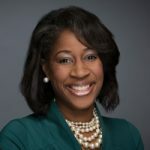 She also held progressive employee development positions at the Federal Bureau of Prisons in Washington, D.C.
As an active community leader, Erickajoy enjoys serving as a trustee at Mount Mary University. Additionally, she is active in TEMPO Milwaukee Professional Women’s Network. She is cofounder and board member of One MKE, an organization dedicated to addressing cultural divides in the Milwaukee community. Erickajoy also serves on several boards including Penfield Children’s Center, Cultural Commons for 88Nine Radio Milwaukee, Raynor Memorial Library for Marquette University, A.L.I.V.E Milwaukee, Links Inc. of Milwaukee and is seated on the leadership team as chaplain for the Milwaukee chapter of Jack and Jill of America. Over the years, Erickajoy has earned several recognitions for her dedication to the community, including a three-time recipient of the Milwaukee Black Excellence award, the Milwaukee Business Journal’s 40 Under 40 award and the Milwaukee Business Journal’s Women of Influence award. Erickajoy has a bachelor’s degree in psychology from the University of Maryland, Baltimore County, and earned her master’s degree in management through Marian University.